ROCKINGHAM — First place was all well and good. It usually is. 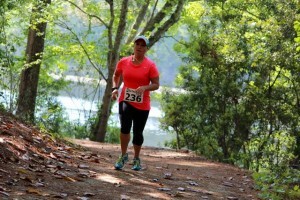 On Saturday for the second annual Run for Technology 5K run/walk at Hinson Lake in Rockingham, however, the magic number wasn’t 1 but 29:31. Kevin Wallace, assistant principal at Rockingham Middle School, finished the two-loop trail course in 29 minutes and 31 seconds. The incentive for some 50 RMS students to compete was this: those who beat him could smother his face with a pie later this school year. 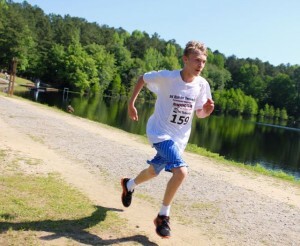 Tyler Parker races to the finish line along the berm at Hinson Lake. 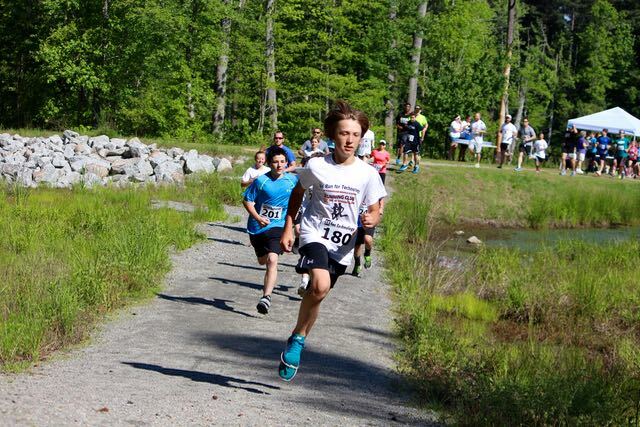 It was a challenge that drew not only RMS students and faculty but rival Hamlet Middle School as well. 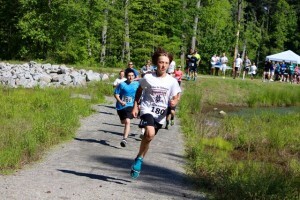 While Tyler Parker, an RMS eighth-grader, took top honors with the overall win in 22:19 — followed by RMS seventh-grader Kevin Aiken in 23:43 and Hamlet grand masters runner and Richmond County Schools employee Mark Long (23:50), Wallace succeeded in his goal of running under 30 minutes and finished second in his age bracket. Despite that best effort, 14 runners qualified to pie Wallace in the face on the last day of school: Parker, Aiken, Alena Craddock, Zach Hamilton, Nate Blunk (RMS teacher), Carson Jordan, Mason Bailey, Evan Hudson, Hailey Miller, Jonathan Rich, Alex Branch, Benjamin Ewing, Noah Jordan and Hannah Bennett. 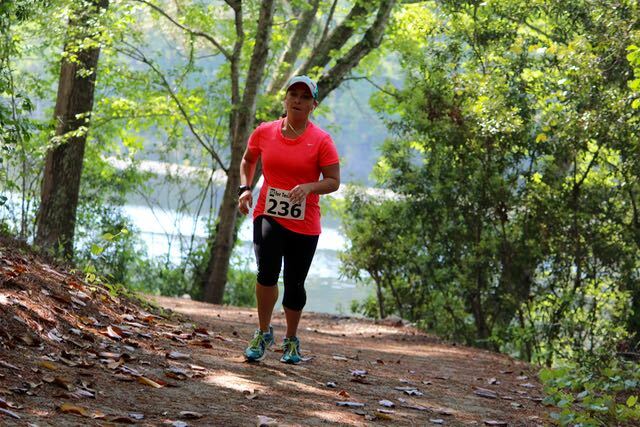 With Hinson Lake in the background, Courtney Ross lead the women’s field. Courtney Ross led all female finishers by stopping the clock in 24:17. 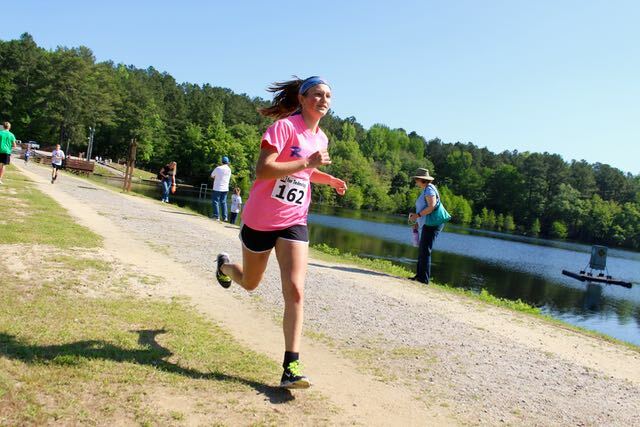 Shelby Matheson was second in 26:13 and Becky Caulder was third in 26:29. 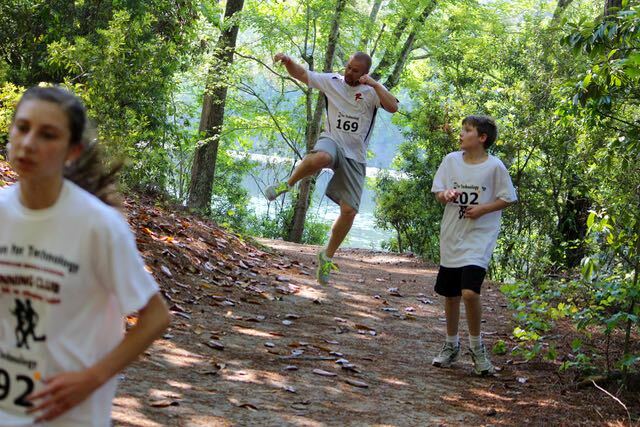 Kevin Wallace, assistant principal at Rockingham Middle School, leaps into the air as he attempts to lessen the number of pies thrown toward his face on the last day of school. Shelby Matheson finishes second in the women’s field. Evan Hudson, a Rockingham Middle School student, is in the air while going up a small incline on the trail around Hinson Lake.